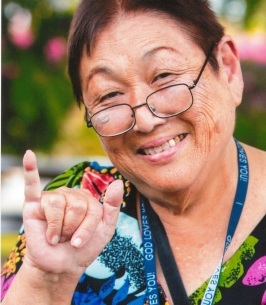 Lorraine Teruko Ramos, 79, passed away on September 13, 2018 in Pearl City, HI. She is survived by sons Michael and Jeffrey Ramos, daughters Medora Ohashi and Caroline Pilar, sister Laura Fukumoto, grandchildren Joby Ramos, Jake Ramos, Jordan Ramos,Allison Wiseman (Joshua), Joshua Ohashi (Marilyn), great grandchildren, Jayden Ohashi, Jaycen Wiseman and Sadie Wiseman. Funeral services will be held on Wednesday October 24, 2015 at Ballard Family Moanalua Mortuary. Visitation is at 10:00 am Services at 11:00 with burial to follow at 2:00 pm at Valley of the Temple Cemetery.